Deeply rooted in the land, people and promise of a solid, rewarding past and equally promising future, Danos is one of the most respected names in oil and gas production asset management. As a valued strategic partner for today’s biggest names in energy for more than 68 years, clients trust Danos. For every 100 new-hire position openings, there are upwards of 3,000 applicants. 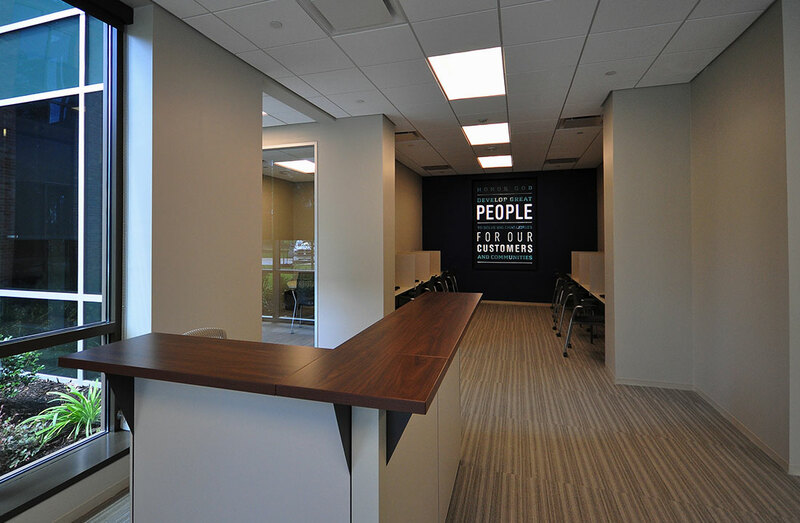 Employees spend their entire careers dedicated to serving Danos clients. It is in this spirit that Danos challenged Gensler, as design architect, Unleaded Communications, as brand agency, and 2020 Exhibits to bring to life their vision for a new corporate headquarters. 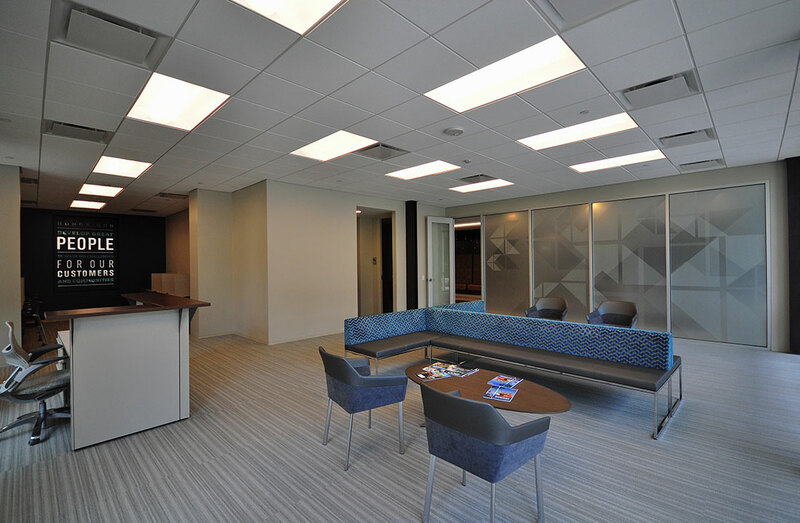 Open, modern, tasteful, inviting, sophisticated and dedicated to industry—this is an apt description of the new Danos corporate headquarters in Gray, Louisiana. 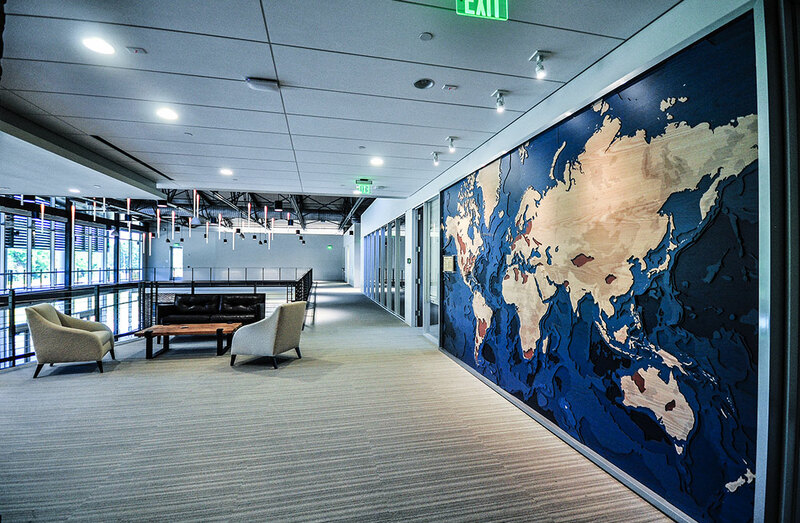 Informed by a deep understanding of the local culture and environment combined with global knowledge and insight, Gensler’s design is infused with the vibrant heritage and legacy of the Danos family, business, and brand. The new headquarters is a sophisticated, timeless building that artfully blends raw and polished elements to weave a powerful story of the Danos’ journey. Seven stately Southern Live Oak trees line the winding entrance road leading to Danos and form a lush canopy. Most typically planted in historical cities for their character and appearance, the live oak tree symbolizes Louisiana, strength, and family. This overarching theme of place and family permeates the design. 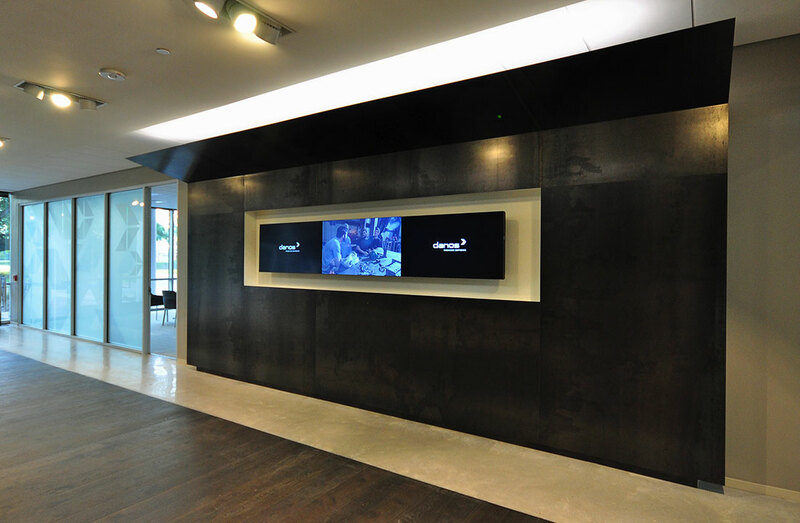 Subtle yet effective brand touch points create a contemporary, polished and welcoming experience from the front lobby and reception area. A fusion of deep, rich woods and warm colors infuse the space, from flooring to the signature, sweeping staircase and landing overlooking the entryway. 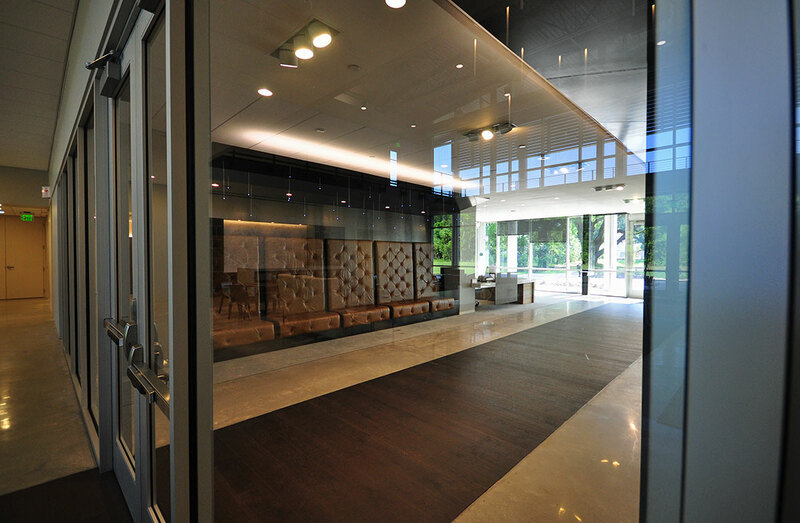 From the initial property visit and walk-through, the 2020 Exhibits team gained a true sense of the environment and the overall vision for this new corporate home. Drawing inspiration from these strong images and a deep, abiding sense of the Danos' culture, 2020 Exhibits worked collaboratively to deliver beautiful, one-of-a-kind statement pieces which are now found throughout the space. 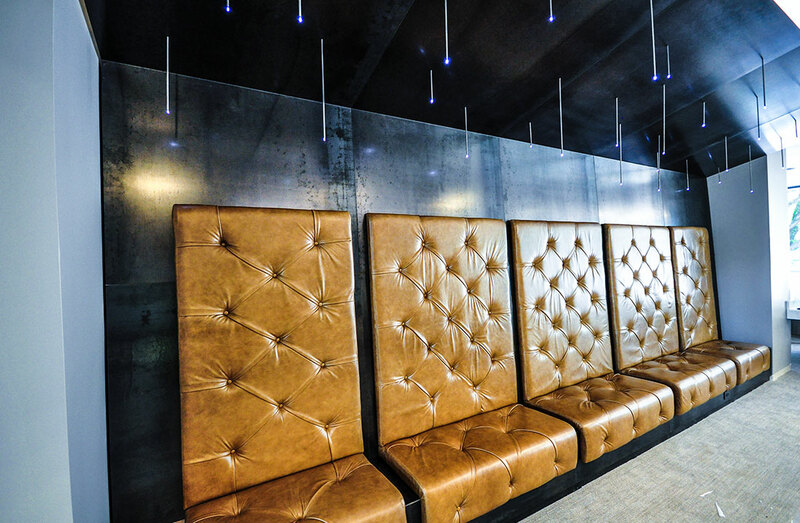 STATELY BANQUETTE & VIDEO WALL - A floating canopy of steel, with a five-foot, angled, arched ceiling and custom-leather seating, this 20-foot-long, custom-designed banquette is reflective of the property’s lush, tree-lined entryway. 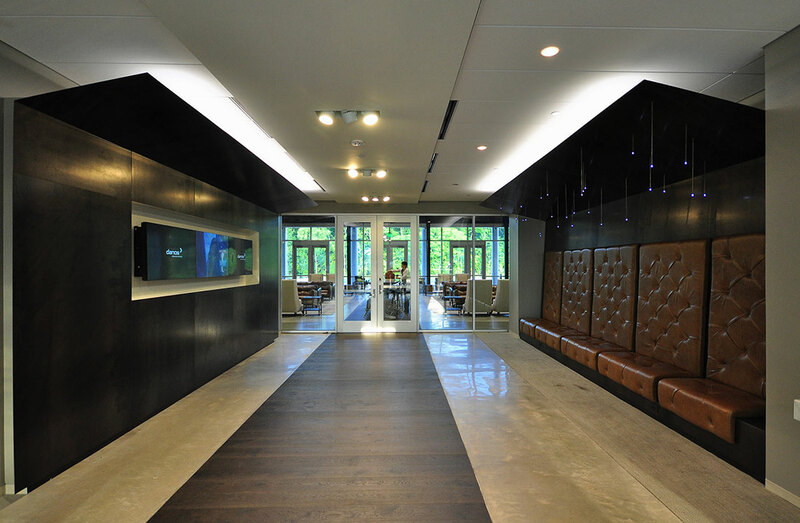 Complimenting this overall sense of symmetry and warmth is a three-foot, arched steel ceilinged video wall, found directly across from the banquette. 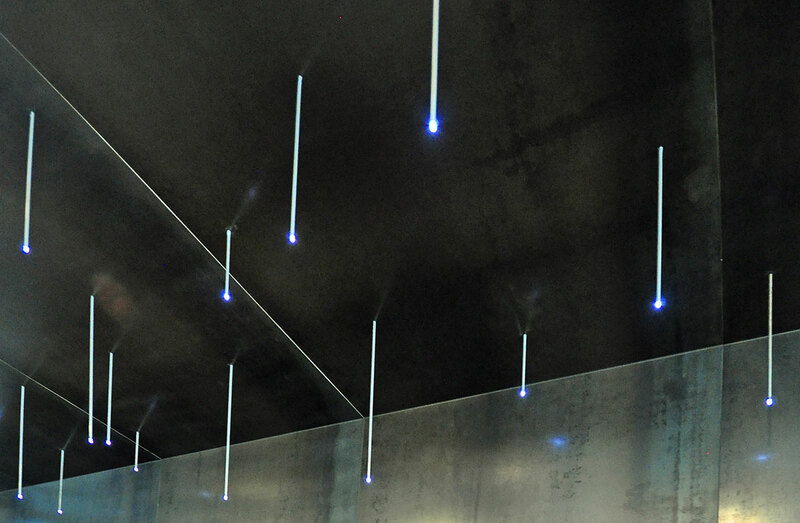 BRILLIANT POINTS OF LIGHT - Simple yet compelling lobby light fixtures, custom-designed and engineered by 2020 Exhibits, serve as brilliant points of light, twinkling like stars nestled high above the floating canopy of solid steel. 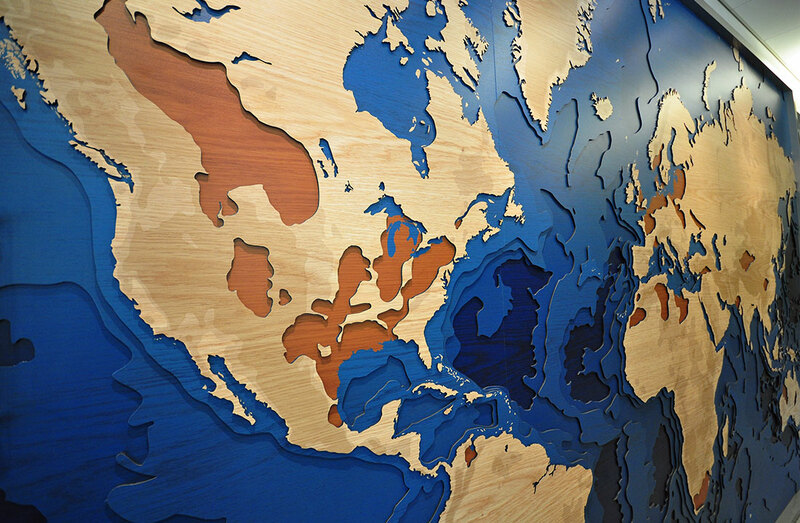 THE BIG PICTURE WORLDWIDE - Artfully placed at the monumental staircase landing, the world map immediately sets the tone for Danos’ global presence in the oil and gas marketplace. 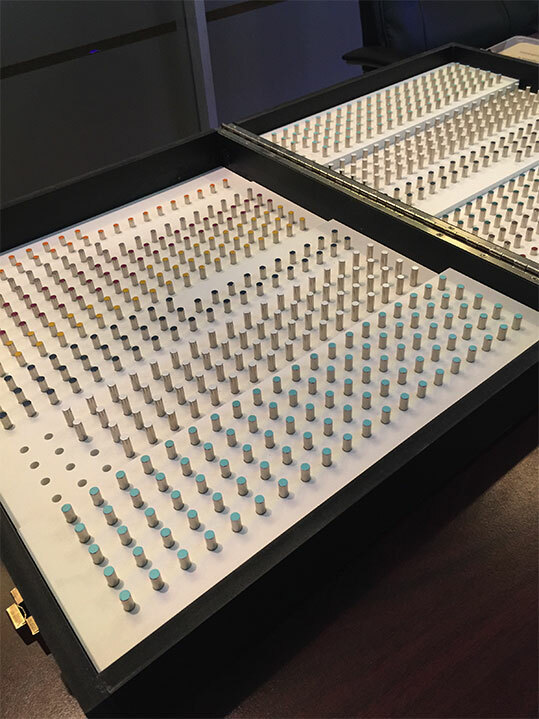 This one-of-a-kind, custom 15’ x 9’ steel panel map is comprised of 225 hand-trimmed, thin, steel pieces, featuring 900 color-coded magnets, with varying heights and polarity, all custom-fabricated and installed by 2020 Exhibits. DANOS SIGNATURE - Guests entering through the elegant front entrance are greeted by a steel, multi-dimensional, back-lit Danos logo. Modern yet refined, this custom logo can be seen shining brightly through the front windows – day or night. In doing so, this illuminated custom sign serves a powerful branding touch point delivering, as they say in Louisiana, a little Lagniappe (lan-yap) or an element of surprise. 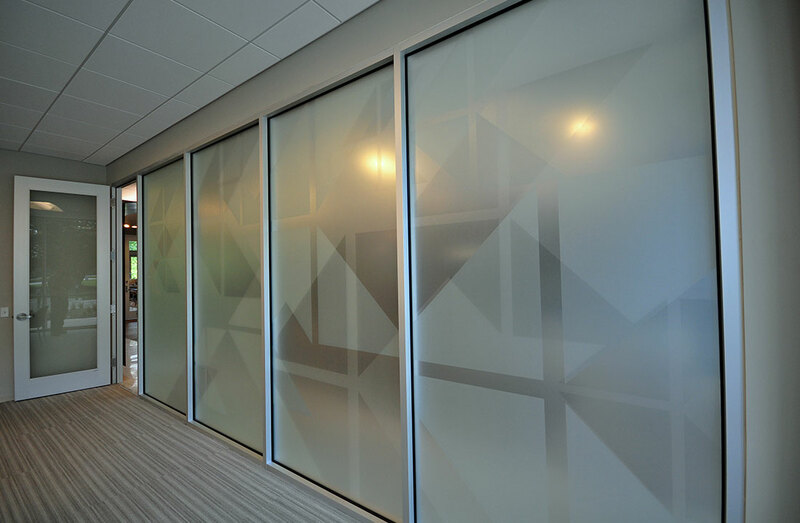 OPEN YET PRIVATE - Fifty, refined, interior, glass-walled offices offer an added measure of privacy with subtle and tasteful brand messaging found in distinctly, Danos-patterned, dusted crystal, vinyl window graphics, which allow light to permeate each space. ILLUMINATING WITH PRIDE AND PURPOSE - For those considering employment, the Danos corporate culture takes a central role early in the process as evidenced by the 54” x 81” Purpose Wall found in the applicant training room. As a timeless representation of the Danos mission, vision, and values, the Purpose Wall is a touch-point that will endure over time. 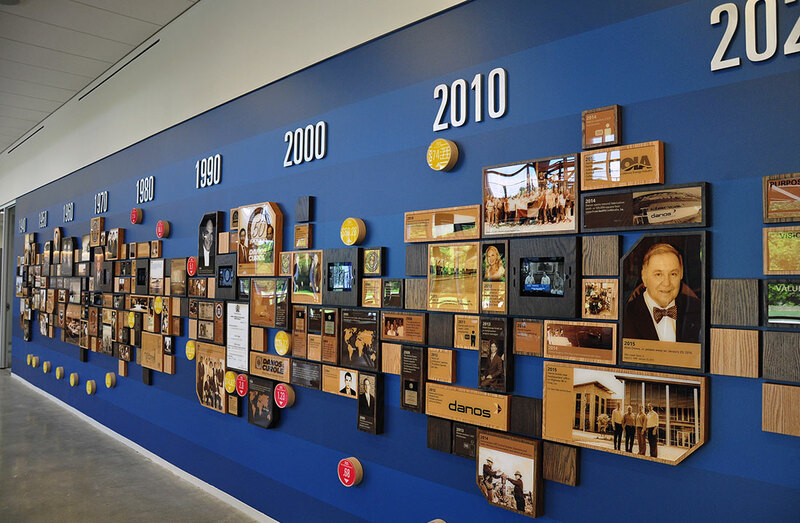 HISTORY IN THE MAKING: CELEBRATING A LEGACY - As a major showpiece in the Great Room, the 38’L x 9’H visually-rich History Wall celebrates and honors the Danos legacy, with a firm eye on the future. 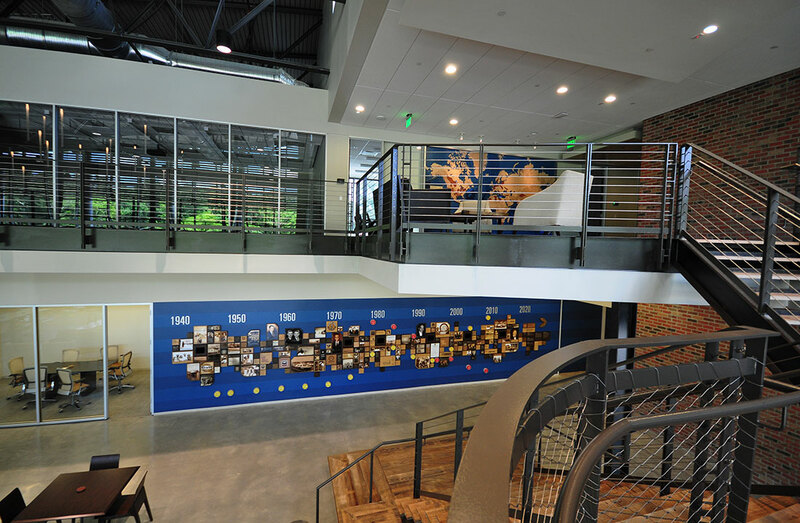 With 80-feet of 2020 Exhibits’ custom-designed and printed wallpaper serving as a backdrop, the History Wall showcases the company’s history, mission and vision, from its early days in the 1940s through to 2020s. Comprised of 240 custom-fabricated wooden box frames create a fluid pattern, with one of three different wood stains and one of three different depths and dimensions seen throughout. 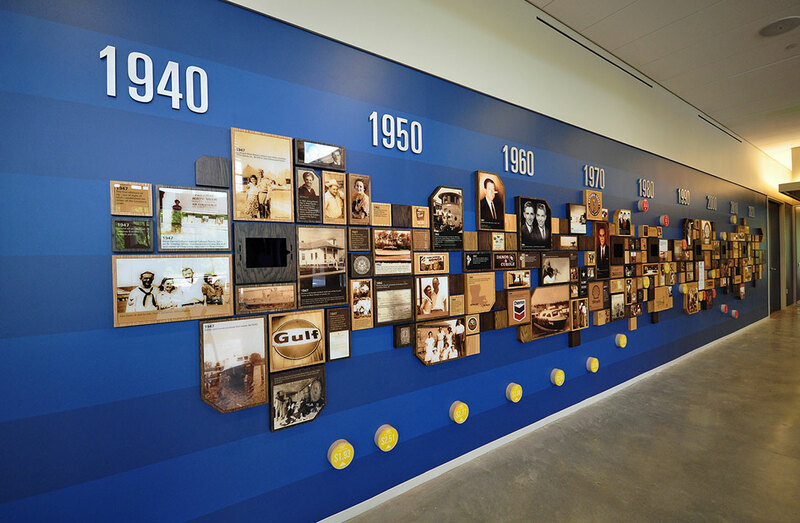 With over six decades to celebrate and a bright, promising mission, and future, the History Wall features each decade in sepia- tone prints and custom-produced videos. The price per gallon of oil and the company’s TIRR rate (an industry measurement of safety incidents) are featured decade-over-decade, in color-coded wooden circles throughout. 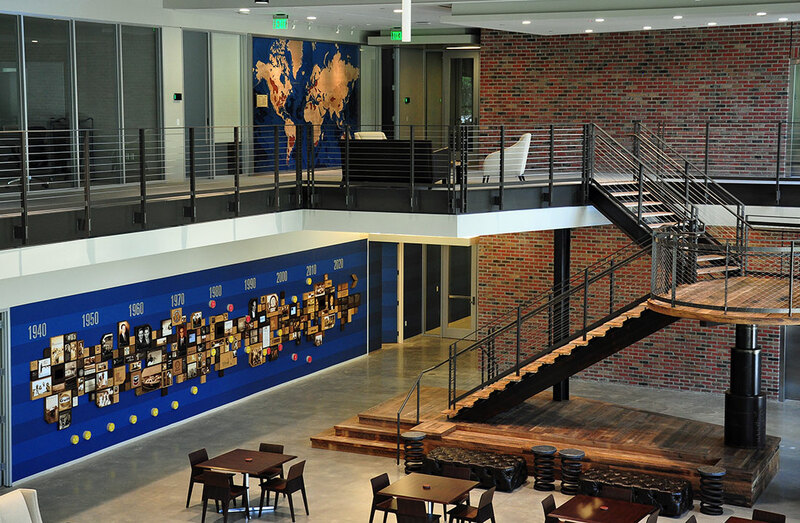 The new headquarters and corporate environment are progressive yet thoughtful, with a deep connection to the place, community, and people that make up the Danos Family. From every touch-point, around every corner and at every turn visitors, family and friends can see, feel and experience Danos; rooted in values and reaching new heights, every day.